There are many ancient and veteran trees here including a Spanish chestnut avenue which is thought to date from 1580 to 1680 and is linked to the Spanish Armarda, an avenue of ancient oaks (pictured), beech and lime avenues, a 1000 year old Quarry oak and a hawthorn orchard. 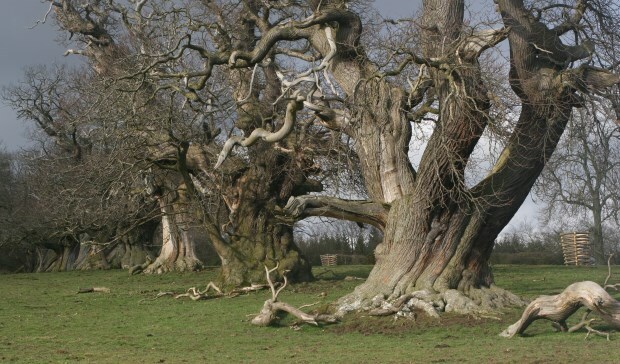 Dr Andy Gordon, who has studied the ancient and veteran trees of Croft Castle in depth, and recorded and verified over 550 for the Ancient Tree Inventory, has written an article on the permanent wood pasture at Croft Castle Park, 2017. The National Trust has put together an Ancient Tree Walk and films have been made about the sweet chestnut avenue and the hawthorn orchard. Volunteer ranger John Parsons has put together a blog about Croft Castle Park , which includes further information about the ancient trees and about the work of the rangers in preserving them, for example through the removal of commercial fir plantations and returning the land to wood pasture.